A few days ago, I wanted to make something in my kitchen that I could store and give out as gifts. I recalled some recipes I've read about for flavored simple syrups. And since ginger is one of my favorite flavors, I decided to start with that. Today, I'll show you three scrumptious uses for Ginger Simple Syrup: In a cocktail, lemonade and atop your favorite dessert. So the first thing you need to do is make the simple syrup, which as its name implies, is quite simple. To fill one mason jar, combine 1 1/2 cups of water and 1 1/2 cups of organic sugar in a saucepan, heat just to a boil and the sugar is fully dissolved. Take off the heat, then add 6 oz. of freshly cut ginger. Allow to steep for a minimum of 30 minutes. (You can taste test this. 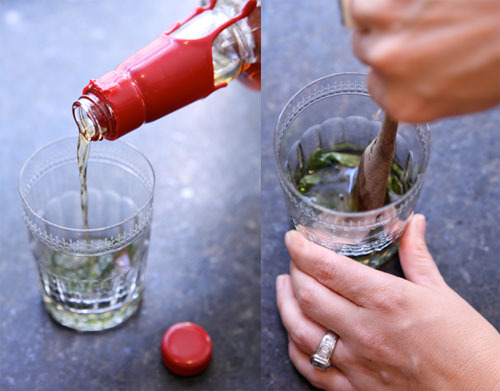 The longer you allow to steep, the deeper the ginger flavor) Pour through a sieve, then bottle in your mason jar. Allow to cool, then store in your fridge for up to one month. BOURBON, MINT AND GINGER COCKTAIL: Grab a handful of fresh mint leaves and muddle them in a glass with 2 oz. of ginger simple syrup. Add 1 oz. of bourbon, a squeeze of fresh lemon, crushed ice and top off with some sparkling water or ginger soda. Garnish with more fresh mint. GINGER LEMONADE: Add 1 cup fresh lemon juice (5-6 lemons), 2 cups water and 1 cup of Ginger Simple Syrup in a pitcher. Mix well. 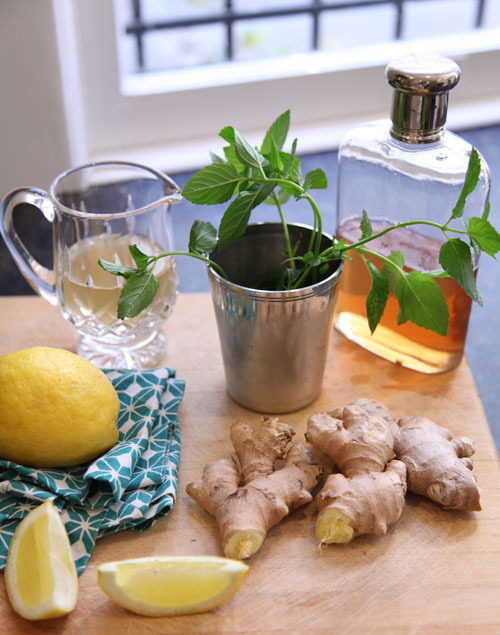 Add ice, a few slices of fresh lemon and garnish with fresh mint. You can add ginger simple syrup to iced tea as well. And since it's Friday, feel free to add vodka or rum. This just makes for a happy Friday, don't you think? This may be my favorite use for ginger simple syrup. Just buy or make an angel food or plain cake, (I got mine at Kroger for just $2.98). Add fresh strawberries, or whichever fruit you love in season and top with ginger simple syrup. It's so...damn...good. Happy weekend, hope this inspires you to make some simple syrup on your own. There are so many great uses for them on the internet. Check out this list of flavored syrups via thekitchn.com. ***Thank you to Wendy Binns, who offered up her home and fabulous prop styling skills to help with the photo shoot.